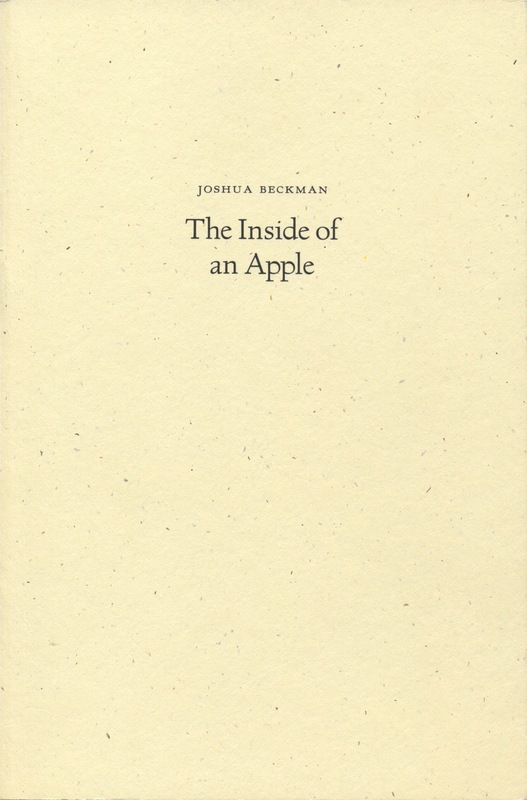 The Inside of an Apple, by Joshua Beckman, Wave Books, Seattle and New York, 2013, 91 pages, $18.00 paperback, www.wavepoetry.com. FULL DISCLOSURE: I am a fan of Joshua Beckman’s poetry. I have found his idiosyncratic, always evolving, sometimes frustrating work to be well worth the trouble; his experiments have opened up possibilities for me as a writer. It’s not easy to define what about his work has won me over so fully. Maybe its courage to continually risk and reinvent, its restless pushing at the possibilities of communication, of form, of honesty and transparency in use of poetic device. Maybe its quiet, subtle particularity, which has the sense of new things being worked out in making poems from the way we think, talk, and see the world. Not how we should do those things but how we actually do. 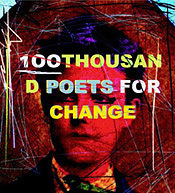 In his latest book, Beckman has swung back from his previous full-length collection Take It, which was full of kaleidoscopic, ragged personae-ish poems and stood at the greatest ironic distance from readers of any of his work. The new book is a very spare, stripped down work, on multiple levels: relatively short at ninety-one pages, mostly using a very short line of one to three beats, and mostly short poems. More than that, the heart of the work is stripped back to a bare, vulnerable seeing and feeling. "Yeah well," it starts in medias res, but in the middle of not a plot, but a conversation or response. Then comes a piece of diction so odd or quirky that it humbles or undercuts the lyrical mode: "my heart's a bean." I think of this as the "flaw," and they show up in almost every poem, always vivid and interesting and inelegant. The unpunctuated poem moves paratactically inside to outside, with three lines about air, wind, and sound, and then flows back toward the speaker's inner world with the "thin happy music/ about being alone," which poises delicately between pathos and benign experience. All of it in language which doesn't claim any high poetic register, but stays close to how most of as talk and think. So these are many of Beckman's elements in this book. The speaker is marginally present, just his sleepiness and clothes-mess on bed in a slow set of observations. The poem takes off in lines six to nine, with the string of elusive, delightful phrases, "summer's Alaska/ crooked on the wall." (This could the chill in the middle of summer.) And the dishes not clattering but clapping like happy people, which ties in with the kitchen where pop music might be playing, or something else in the world of "woo woo," be it people cheering or children's noises. In this way Beckman plays at the edge of communication and open-endedness. Here, except for the line with "seclusions" (that's the "flaw"), the language stays strictly ordinary. Intensity accrues in the paratactic spareness, enjambments pressing against syntax to spread out meaning, e.g. "the day flowers and in a bowl" sits by itself, so that "flower" hovers between noun and verb. But the mode shifts from documentary to full emotion with the second stanza. The rhythm speeds up and the lines lengthen as the speaker places numbness against persisting and continuing to "[see] with his eyes." The "one" of this stanza, next to the "I" who poured water in the previous one, moves away from the first person to speak for the writer, or the children, or parents in the life of "calm patterned seclusions." In such a muted, downplayed aesthetic, all that repetition is electric, haunting. This aesthetic of spareness traces a lineage to William Carlos Williams. Maybe the most pronounced echo of Williams is the thin page-trailing piece "How the mountain calmed me down" with its one-syllable lines, calling to mind Williams' "The Locust Tree in Flower," ("Among/…," " bright//green/…"). "Madrigal of trashbird," another poem of close observation, of a bird hopping in the street with a hair wrapped around its beak, echoes Williams's "The Term," though this poem moves back and forth from this mode to the ironic mode I'll come back to. I want to say more about the "flaw," Beckman's awkwardness, the way he works against being "poetic." (This poem has particularly airy lineation, which does make it much like the snows it describes.) "Eachy," spell-check marks it red, is the "flaw" or point where the language twists into an interesting and awkward position. The neologism does real work for communicating a thought about the particularity of the little snows, and at the same time in its oddness it turns toward the inscrutable. This twist can be at the level of vocabulary, diction, or syntax, but it appears in almost every poem, decentering the music, stretching away from harmony, refusing to be graceful. Sometimes whole poems, or longer passages, work in this mode, with strained diction, playful and/or ironic tones distancing the poem from its content or the reader. "God's cabin's a jungle/" begins one example, "ain't no fear of lions there." "That's Not What I'd Do" is another of these longer poems in the ironic register (and a rare one with a title). "The blue ghosts of what they call equipage," Beckman writes in the middle of a playful, somewhat inscrutable stanza about "my little dressed-up poem." "What they call" allows him to bracket a word like equipage that isn't part of the regular speech and thought from which he builds his poetry. I think the longer pieces in this mode do the same thing, to extend the poetry's range to think about things that can't be handled with sincerity or starkness, that need more complexity, that need to be bracketed. This mode is part of Beckman's pressure against unthinking poetic posture, his determination to expose the workings of his own mind and not fall back on some accepted poetic code. a grass hinge in the fire fluttering. To my ear this last line flashes out of the off-kilter irony with a surprising, breathtaking loveliness. A "grass hinge" doesn't give us exactly a signified object, but it does evoke a field of interesting possibilities. In some wild place with a fierce wind blowing outside, the "terrors of/ feeling night" and the "cower" of the first and last lines bracket his effort to be a "nature poet." His room is shaking because of his own terror, or the wind; the inner and outer worlds fuse and foil his attempts to inscribe tranquil natural beauty. In this collection there's quite a range of emotion, from fear to tenderness toward another person or the world, from bitterness to playfulness. I think as his work develops Beckman is finding ways, from occasional deployment of a title, to exposing more inner feeling, to let himself be pinned down and found by the reader. Again the simple syllables "arrange" into a careful, surprising pattern, that does take us out that window into the world of vast spaces, so much time that dead stars can still give us light, and a sickle that might cut the grass that covers the world. That's the Beckman package—a poetics struggling against itself, resisting its own poem-ness, dancing in and out of hiding, full of risks and innovations, loveliness that is difficult to explain. Not being able to explain is perhaps the point—these are poems that work gently, respectfully, insistently, almost reverently around the incommunicable. They do this without giving up on communicating something important. 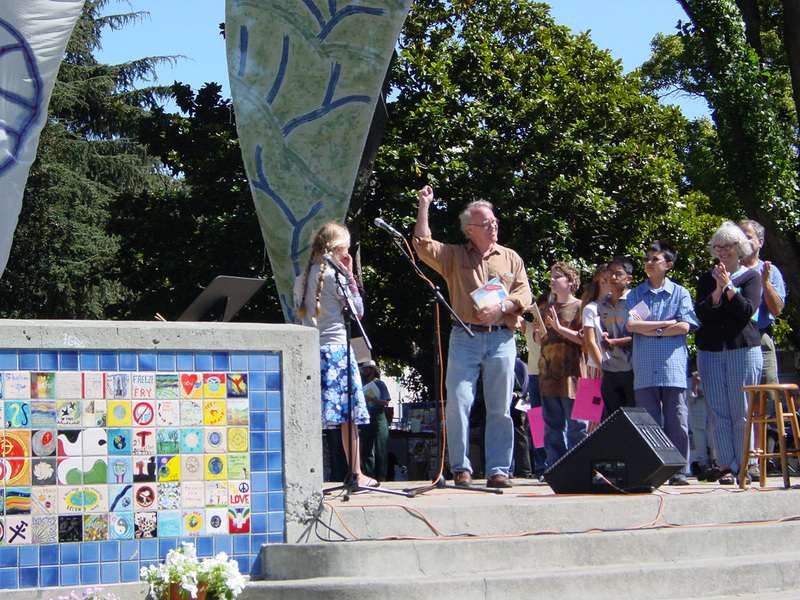 Dan Alter lives and writes in northern California's East Bay.